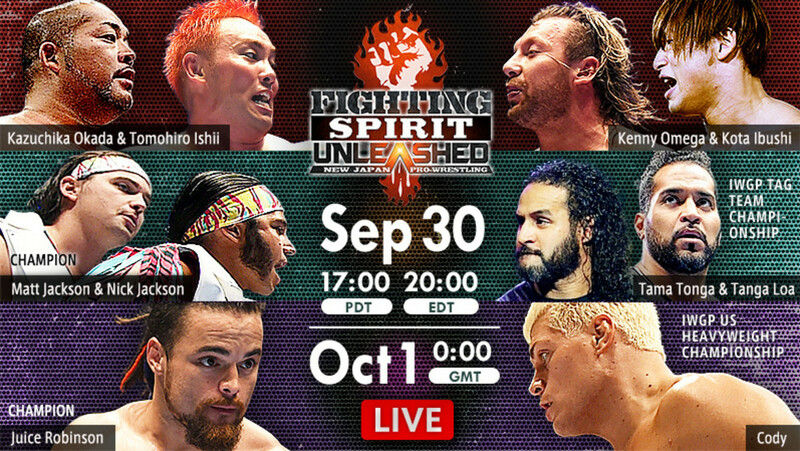 New Japan returns to Long Beach, California tonight for Fighting Spirit Unleashed, where a number of key matches will take place. Two titles will be on the line tonight, one which will feature Cody challenging current champion Juice Robinson for the IWGP United States championship. The Young Bucks will also make their first defense of the IWGP tag team titles as they will face the Guerillas of Destiny. There’s no love loss between the four following what happened in San Francisco back in July. Will Ospreay and Marty Scurll will clash once again tonight as well, this time with the winner meeting KUSHIDA at King of Pro Wrestling on 10/8 for the vacant IWGP Jr. championship. The show will be headlined by a tag team match pitting the Golden Lovers against the CHAOS team of Kazuchika Okada and Tomohiro Ishii. Join us for live coverage this evening at 8 p.m. EDT. The show will air live on New Japan World, with the AXS TV broadcast airing this Friday at 8 p.m. EDT. This was a pretty hot opener. There’s noticeable empty seats throughout the arena, but the crowd is still hot. Rocky briefly had the heat on Liger but cut him and R3K off and tagged in ACH, who made a nice hot tag. Rocky and Taguchi are back in. Taguchi runs wild with the hip attacks. ACH wiped out 3K on the outside with a double suicide dive as Taguchi planted Romero with the dodon for the win. Good opener. This was a good, solid tag team match. Page and Owens showed some good tandem offense. Kazarian made the hot tag to Daniels. Page went for the shooting star shoulderblock on the outside but Kazarian got the knees up and took him out. The duo then laid out Owens and Daniels hit the BME for the win. CHAOS worked on Sabin until he made a hot tag to Gordon, who ran wild on everyone with some really cool looking offense. Goto gets tagged in and runs wild on Cobb. Goto attempted a GTR but Cobb countered with a suplex. He missed a standing moonsault as the Best Friends came in and took out Cobb with a double suplex. Cobb laid them out out with a double suplex in return. Chuckie piledrove Cobb and went for the moonsault, but it didn’t connect. Cobb gave him a lariat then pinned him following the tour of the islands. A good match and a great highlight reel for Cobb. Goto confronted Cobb after the match as the two had a staredown. Doesn’t look like the end for them. Much like in the previous matches, KES worked over SANADA. He tagged in Naito who went at it with Davey Boy Smith Jr.. Sabre and EVIL were tagged in, and went at it as they’re in the middle of a feud. EVIL hit a cool fisherman’s buster and tagged in SANADA as all three LIJ members went at it. Naito and SANADA took out KES as EVIL went for the STO but Sabre countered out of it. EVIL hit darkness falls, but Sabre kicked out. EVIL went for the STO again, but Sabre escaped, bridged EVIL and pinned him in another good match. KES beat up one of the young lions after the match for good measure. EVIL wasnt happy about taking the pin. Tanahashi went to the top rope for the high fly flow, but when White got the referee distracted Gedo punched Tanahashi with what may have been brass knuckles. White then grabbed Tanahashi and hit the Bladerunner for the win. A solid match, not really into the ending. White grabbed a microphone after the match. The crowd wouldn’t let White talk and drowned him out in boos and other naughty chants. White says Okada drew with you, but I beat you and thus I have the rights to this briefcase. He asks what is he waiting for? He says you and NJPW are scared because NJPW can’t deal with the thought of him or two headliners in the main event of WrestleKingdom. White says that it is an inevitability, and you and everyone here will breathe with the Switchblade. An excellent match, it goes without saying that these two have excellent chemistry with one another. The layout of the match was so well done. Ospreay went a million miles an hour right at the bell, hitting a giant spanish fly, a Sasuke special, shooting star press then a suicide dive all within the first minute of the match. Scurll catches him on the outside with a superkick. He takes Ospreay to the ring and works him over with chops. Scurll works on Ospreay’s neck, dragging him to a bottom rope and using all of his weight while standing on Ospreay’s neck. Ospreay comes back with a springboard kick, but Scurll cuts him off and takes him back to the outside. Back in the ring, Ospreay cuts him off and hits a giant sunset flip bomb to the floor. The two traded offense, with Ospreay getting the better of thing with a lariat. The two meet on the top rope, where Scurll hits a springboard hurricanrana. Ospreay powers through Scurll chops and unleashes some of his own. The two trade some great back and forth near falls. Ospreay connects with the cheeky nandos kick and went to go for something off the top rope, but Scurll meets him there again and smashes his head into the turnbuckle. Scurll unleashed a giant chickenwing suplex, then what I can only describe as a package sidewalk slam. Scurll then got the win with Graduation. This makes it Marty Scurll vs. KUSHIDA at King of Pro Wrestling for the IWGP Jr. title. A different match than most Young Buck bouts, but a good match that told a good story. The match starts out pretty even, until Tanga Loa took out Matt with a running powerslam. A table was introduced by Loa. The Young Bucks fire back, with Nick hitting a big dive onto Loa. Matt tries to go something on the top rope, but Tonga shoved Matt off, sending him into the table. GoD focus on Nick as they work him over. They got the heat on him for a while until Matt came in and made a comeback. Matt went for a sharpshooter on Tonga but Loa attacked his back. They continued to work over his lower back until he finds and opening and tags in Nick. The Bucks try for the More Bang for Your Buck but Matt’s back kept bothering him, and took a long while before he could actually connect. They try for the Meltzer driver but Tama Tonga hits a gun stun out of nowhere. An assisted gun stun on Matt seals the deal. I liked this match a lot, not blow away but very good. Great heel work by Cody and Brandi throughout, and the finish was excellent. Cody went for a dive off the top rope but Juice grabbed him on the outside and hit a belly to belly suplex. Brandi Rhodes, who accompanied Cody, tried to grab Juice but he shoved her away. In the confusion, Cody laid out Juice with an inverted DDT. Juice came back with some roll ups, then connected with the cannonball in the corner. He went for a running powerbomb, but Cody countered with a hurricanrana that sent Juice into the turnbuckle. After Brandi rake the eyes, Juice managed to dodge a kick by Cody and connected with a crossbody. Cody countered Juice with a figure four lock. Juice reversed it as Cody escaped and was consoled by Brandi, who gave him water. After distracting the ref, he blinded Juice with water and laid him out. Juice came alive and ended up hitting the pulp friction. But once again, Brandi came to Cody’s rescue by dragging him out of the ring. After telling Red Shoes to stop counting, he exited the ring to grab Cody, only for Cody to come alive and plant him with the crossroads. They make it back to the ring where the two start exchanging punches until Cody rakes Juice in the eyes and laid him out with the Din’s fire (vertebreaker). Juice cut off Cody on the top rope and connected with a superplex, but Cody out of nowhere hooked Robinson’s legs on impact, cradling him and scoring the pinfall and the championship. Great main event. It was nothing but action throughout and ended up turning into a really heated tag team match. Things start off with some solid tag team work -- Ishii worked against Omega, and Ibushi worked with Okada. The story of the early portion of the match was that Omega and Okada avoided one another, but every other variation worked against one another until finally Okada was tagged in. They went at it briefly before the Golden Lovers wiped both Okada and Ishii out with the Cross Slash. Okada and Omega eventually do see eye to eye as they traded offense. Okada escaped a One Winged Angel attempt and connected with a dropkick. Golden Lovers connected with with tandem offense as Omega lays it in with a v-trigger. Okada counters another One Winged Angel attempt with a tombstone, and Ishii connected with a sliding D.
Omega laid out Okada with a uranage as Ishii and Ibushi came back in. The two exchanged strikes, which Ishii got the better of. He then hit a moonsault, but landed his knees on Ishii’s gut. Golden Lovers go for the Golden Trigger but Okada breaks it up. Ishii came in and soon enough all four men are laid out. Ishii and Ibushi exchanged strikes once more, with Ibushi again getting the better of things with a lariat. Ishii powers back and Okada helps him get the advantage. Omega takes out Okada on the outside as Ibushi blocked a lariat and scored a huge kick to the head. Ibushi tried for the kamigoye but Ishii headbutted him. Omega comes in and they connect with the Golden Trigger for the win. Omega after the match said it wasn’t the best night for the Bullet Club, and apologized to the Young Bucks. Despite some empty seats near the rafters, he sees so many familiar faces, happy faces who were happy to see The Elite. The worldwide movement is only beginning. He then turned his attention to Ibushi. He said that when we decided to protect our ten year promise, it proved to be a disappointment to the front office and the fans. They want to see the rematch. At that moment, Cody came out. He said let me help you out and alleviate the burden. He asks the crowd if he wants to see the rematch....Kenny Omega vs. Kota Ibushi....vs. Cody Rhodes. Omega said that this is actually ingenious. They want to make history, and they want to do it their own way. Let’s show the beauty of professional wrestling and have a triple threat match. This isn’t personal, this is about the beauty and originality of professional wrestling. So it looks like we have our main event for King of Pro Wrestling next weekend.